In the age of rebooting past pop culture, many properties are announced years ahead of time and written about endlessly. In film we've seen loads of 80s remakes that have already been forgotten. TV has reignited properties such as 24, Full House, and Gilmore Girls. Most of these reboots, especially in film, are nostalgic cash grabs (occasionally there’s a good one). But opposite of that approach, and a rarity, is another kind of nostalgia that is earnest and in the spirit of Spielberg and Lucas creating Indiana Jones as an ode to the films of their youth. One month ago no one knew who Matt and Ross Duffer (creators/writers/directors) were and no one knew about Stranger Things' existence. In what felt like a few hours, it exploded into a pop culture phenomenon in a way that hadn't been seen on TV since True Detective (2014). 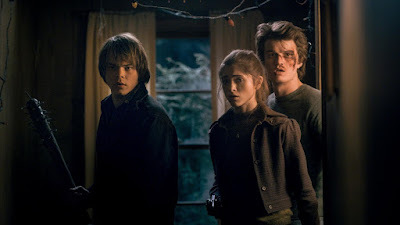 Stranger Things is initially an obvious ode to Amblin entertainment and cinema of the 80s, but it quickly reveals itself to be something much like how the movie brats made films in the 70s that were homages to their directing heroes. 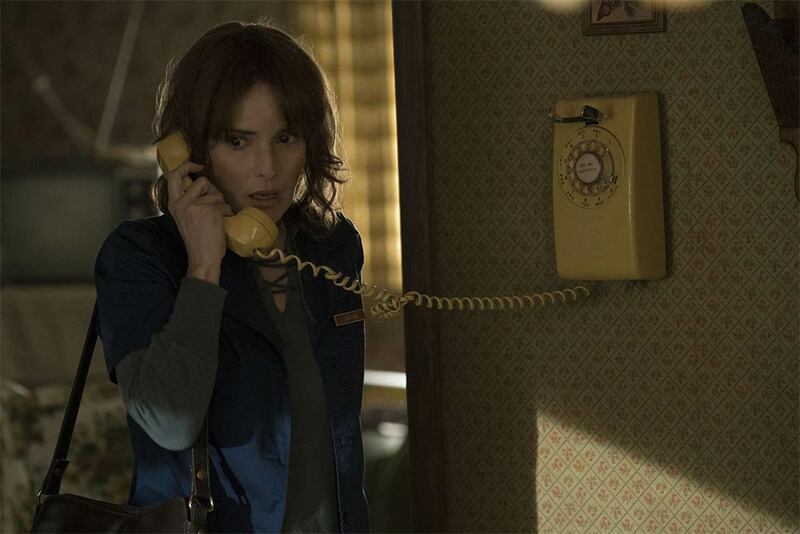 What Stranger Things captures beyond aesthetics, archetypal 80s characters, and Sci-Fi plotting, is the excitement of seeing a new story with great characters in an era when you know almost everything about popular entertainment. Stranger Things is THE blockbuster media of 2016. 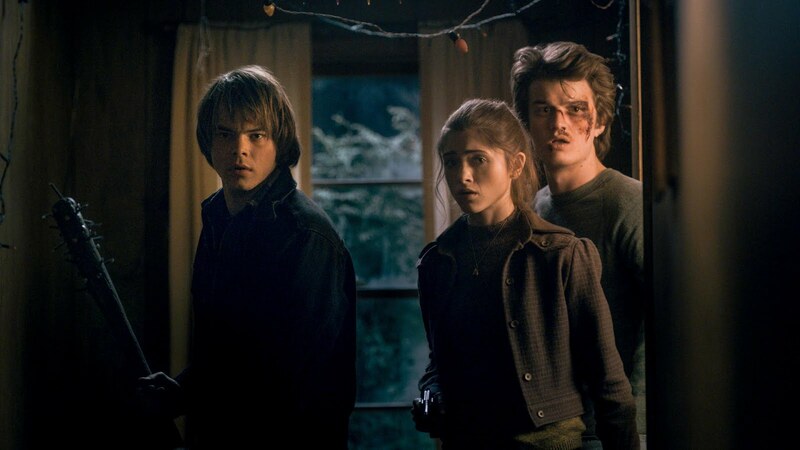 The Duffer Brothers creation is a wonderfully weird and HIGHLY bingeable 8 episode Netflix series, and if you've recently been on the Internet then you already know this and you've probably seen it already. If you haven’t, please do. I've watched it twice! For the uninitiated, it's a story about 3 dorky but lovable boys, all of which are plucked from The Goonies and Stand By Me. The Hardy boys mystery begins when a supernatural force takes their friend Will Byers. Winona Ryder, once the queen of late 80s entertainment, plays Will’s mother, Joyce. She goes full Winona Ryder (a great thing!) and channels her inner Roy Neary as she grows paranoid that her son may still be alive somewhere. The four boys are all superbly cast, but the lead is Mike, our “Elliot,” who leads the boys to find a telekinetic girl named Eleven, who may or may not be connected to Will. Elsewhere is Mike's older sister, Nancy, and her boyfriend, Steve (sporting the best hairstyle in years) who mirror Lea Thompson and Tom Cruise in All The Right Moves. But the hero and breakout star of the show is David Harbour's Police Chief Jim Hopper, the Han Solo of this story. The series unravels like a Stephen King novel with the formal techniques of Spielberg and Carpenter. I won't spoil any of the mystery here, but at 8 episodes (about 45 minutes each) it's paced perfectly with each episode executing it's characters and plot to peak bingeability. This could exist as a 6-hour film and never drag. The storylines of the kids, Nancy + Steve, Joyce, and Hopper each have their own equally thoughtful and entertaining arcs that intertwine. Yes, it's a TV show, but under the microscope of all pop culture it fits best as a piece of popcorn entertainment built through cinematic inspirations, which is why it feels like a blockbuster film. It’s campy, exciting, sad, scary, funny; Everything that you'd find in the golden age of blockbusters. In today's landscape it's shocking how fresh a story not about superpowers or the end of the world feels. Perhaps it's because I'm a massive fan of his, but the use of space and location reminded me of David Lynch's Twin Peaks. The town's apple pie Americana and teenage landscape is paralleled with the woods that lay at the end of it's perimeter, a horror film that swallows whole the freedom of youth. Even the show's filmic references shift in these two locations. The town is mostly seen in the daytime and channels Spielberg's E.T., Reiner's Stand By Me, and Donner's The Goonies. The dark wood setting evokes John Carpenter's Lovecraftian terror, Guillermo Del Toro's monsters, David Cronenberg's body horror, and even Jonathan Glazer's Under the Skin (2014). Inside the woods are the secrets to the mystery of the missing boy and slowly it's horrors move into the town like fog. The filmmakers solidly recreate their inspiration’s aesthetic and meld interesting characters with sci-fi ideas that are fresh enough that you won't feel like it's rehashing the greatest hits of Science Fiction. It does commit the sin of referencing its inspiration through dialogue and posters, which is a big “no no.” If you’re not in love with the characters (any sane person will be) the show’s homages may start to tear the seams of the story, but there’s too much focus on character for it to unravel. The only big lacking ingredient is that budget restraints and lack of directing experience don't allow Stranger Things to have epic movie moments. Those hoping for a Close Encounters UFO set piece or an E.T. flying sequence will be disappointed. The Duffer Brothers likely knew about these restraints and were smart to keep the plotting and characters closely knitted while keeping the stakes high through intimacy. As I watched the show I was asking "why am I so profoundly nostalgic for a time that I didn't live in?" Then it hit me. While it has the aesthetic, music, wardrobe and plotting of 80s touchstones, it's not really about that. It's about hanging out in your friends basement, your first significant other, riding bikes around your hometown (with no helmet! ), sneaking off at night, missing a loved one, the adventure of the everyday, and caring deeply about something. We are in an entertainment culture that is crowded with owned properties of existing characters and stories. A decade ago this was mainly present in film but now television has followed suit with stuff like Gotham, Sleep Hollow, Marvel shows and Supergirl. Netflix, HBO, Hulu, and Amazon have emerged as the new independent filmmakers. Perhaps in the future pop art phenomenons will mostly exist in online culture and pockets of the Internet (I do still have faith in big budget cinema). Like the blockbusters of the 70s and 80s they'll come out of nowhere to dominate pop culture. The next sensation could come from anywhere, and that's exciting. There have been shows that suggested a shift like this, but Stranger Things strikes me as the first time a TV show has stolen the thunder from film to be the premiere pop entertainment of the year.